During remodeling, there is simultaneous collagen formation and degradation, while the presence of myofibroblasts contribute to increasing the tensile strength within the wound. Granulation tissue deposition wanes as the cells responsible during this stage undergo apoptosis; failure for this to occur may result in a hypertrophic scar. In the case of a hypertrophic scar, an overzealous healing response occurs, in which fibroblasts, small vessels, and collagen fibers are arranged in a nodular pattern. Alternatively, collagen can be inadequately replaced and, as a result, can form a pitted appearance resembling the surface of a golf ball. The purpose of this article is to review the strengths and limitations of current laser technology used to improve the appearance and symptomatology of hypertrophic scars, keloids, striae, atrophic scars, and acne scars. Related Medscape articles include Keloid and Hypertrophic Scar, Lasers, General Principles and Physics, and Scar Revision. During the early 1980s, Anderson and Parrish revolutionized dermatologic laser treatment by defining a concept known as selective photothermolysis. This theory describes the use of laser energy to achieve localized photothermal injury of a targeted chromophore. From this idea, pulsed lasers were developed in which a short burst of photoenergy (photons) is delivered to a particular chromophore whose optimal wavelength of photoabsorption is distinct from its surrounding tissue. This technique facilitates transfer of heat from photons, with the aim of keeping the converted thermal energy confined to a particular target, thereby diminishing widespread destructive or nonselective effects on normal surrounding tissue. Despite the characterization of selective photothermolysis, to this day, the exact mechanism by which lasers improve the appearance and quality of scars remains largely unknown. Dierickx and colleagues  had similar findings the following year, in which they reported an average improvement of 77% after 1.8 laser treatments of erythematous or hypertrophic scars. Later, Alster and Williams  compared the clinical, textural, histologic, and symptomatic responses in a split scar study involving hypertrophic and keloidal median sternotomy scars. Significant improvement in texture, erythema, scar height, and pruritus was observed at 6 months after the PDL treatment. In addition, they histologically demonstrated increased numbers of mast cells at the lasered sites. Subsequent studies also showed improvement in keloid scars following PDL treatment. In 1996,  Alster and McMeekin also reported improvement in erythematous and hypertrophic facial acne scars following treatment with the 585-nm PDL. In 2003, Nouri and colleagues  showed that the 585-nm PDL can improve the quality and appearance of surgical scars when used as early as the day of suture removal. Scars were treated 3 times at monthly intervals and were significantly more improved compared with controls in overall Vancouver Scar Scale comparisons (ie, vascularity, pliability, height, and cosmetic appearance). In a 1995 report, Goldman and Fitzpatrick  described a combination approach to scar management, in which they treated facial and nonfacial scars with the PDL and intralesional triamcinolone, concluding that PDL served as a useful adjuvant in erythematous, hypertrophic scars. Improvement in nonerythematous, minimally hypertrophic scars was also achieved following combination treatment involving pulsed dye technology and carbon dioxide laser vaporization. In 1998, Alster and Lewis  treated selected scars by performing carbon dioxide laser deepithelialization followed by PDL therapy. Significant and prolonged clinical and textural improvement was observed in all treatment areas. Hypertrophic scars are pink, raised, firm, erythematous scars. They occur approximately within a month following surgery or trauma and result from overzealous collagen synthesis, mainly type III, coupled with limited collagen lysis during the remodeling phase of wound healing. The result is the formation of thick collagen bundles consisting of fibroblasts and fibrocytes, arranged in nodules rather than in the normally smooth fashion. Hypertrophic scars may be symptomatic, characterized by pruritus and/or dysesthesia,  and are more likely to arise in sites subjected to increased pressure or movement. Despite obvious tissue proliferation, hypertrophic scars remain within the confines of the original integumental injury, in distinction to keloid scars, which extend beyond the original cutaneous injury. Unlike keloids, which tend to persist indefinitely, hypertrophic scars may regress spontaneously. This pathologic scarring is more common than keloid scaring. Seethe image below. Erythematous and hypertrophic laceration scars before (A) and 3 months after (B) a second 585-nm pulsed dye laser treatment. Improvement in scar redness, symptomatology (decreased pruritus), and thickness were achieved. Courtesy of Tina S. Alster, MD. Keloids are raised, reddish-purple, nodular scars that are firmer than hypertrophic scars,  and they may develop weeks or years after the initial insult, or even arise spontaneously. Keloids develop during an extended proliferative phase of wound healing,  and they demonstrate thick, hyalinized bundles of collagen arranged haphazardly in whorls, in a mix of type I and type III, with increased hyaluronidase. Unlike hypertrophic scars, keloids extend beyond wound margins and may even continue to grow over time. Although they occur in all skin types, keloids are most common in patients with darker skin and, like hypertrophic scars, may be associated with pruritus and/or dysesthesia. See the image below. Keloid scar on the anterior chest before (A) and several months after (B) a second 585-nm pulsed dye laser treatment. While decreased erythema and scar bulk are noted, further pulsed dye laser treatments are necessary (at bimonthly intervals) to provide further scar improvement. Courtesy of Tina S. Alster, MD. Striae distensae, or stretch marks, are linear bands of atrophic or wrinkled skin. They result from excessive dermal stretching, such as after rapid weight loss/gain, pregnancy, or pubertal growth spurts. Dermal inflammation with mast cell degranulation, elastolysis, and dilated capillaries mark the initial presentation,  which results in an erythematous appearance of young striae distensae (stria rubra). Later, striae appear hypopigmented and fibrotic owing to linear deposition of dermal bundles and thinning of the overlying epidermis (stria alba). Their pathogenesis remains unclear, although estrogen and mast cell degranulation with elastolysis may be contributing factors. See the image below. Erythematous (early) striae distensae before (A) and after (B) a single 585-nm pulsed dye laser treatment. Reduction in erythema and mild improvement of skin surface texture were observed. Courtesy of Tina S. Alster, MD. Acne scars may be categorized as hypertrophic or atrophic, the latter of which can be further characterized as ice-pick, rolling, or boxcar scars. [27, 28] Ice-pick scars are usually narrow (< 2 mm), sharply demarcated tracts that can reach deep into the dermis or even the subcutaneous tissue. They are typically wider at the epithelial surface and taper as they go deeper. Rolling scars tend to be shallower, wider (4-5 mm), and produce an undulating appearance in otherwise normal-appearing skin. This rise and fall of the skin surface is due to abnormal fibrous attachment of the dermis to the subcutis. Boxcar scars are wider at the base than ice-pick scars, but do not taper. These round- to oval-shaped skin dimples have sharp margins and can be either shallow (0.1-0.5 mm) or deep (>0.5 mm). See the image below. Atrophic acne scars before full-face carbon dioxide laser resurfacing (A). Six months after the procedure (B), mild improvement was observed in terms of scar severity and skin surface texture. One year later (C), further clinical improvement was apparent because of continued and prolonged collagen remodeling. Courtesy of Tina S. Alster, MD. When evaluating a potential candidate for laser surgery, the physician should consider certain factors that can complicate therapy. While not absolute contraindications to laser surgery, these factors can significantly influence treatment. The surgical technique calls for a series of adjacent nonoverlapping laser pulses delivered across the entire scar breadth. The entire scar should be treated at each session. The scar's size, thickness, location, and color, as well as the patient's skin type, determine the energy density that should be used. Less fibrotic scars in sensitive skin areas (eg, anterior chest and breast) require lower energy densities, while thicker or darker scars can be treated with higher fluences (see Pulsed dye laser treatment considerations and protocol in Summary). In general, treatments should begin at lower fluences, allowing for flexibility of upward energy adjustment depending on the scar’s response to earlier treatments. If the initial treatment session produces beneficial results, the energy density should remain constant on subsequent treatments. If minimal results were achieved, one should consider increasing treatment fluences in steps of 10%. If the patient reports postoperative vesiculation or crusting, consider a lower fluence with special attention to operative technique (ie, avoiding overlapping pulses). Postoperative purpura following treatment with the PDL usually resolves within 7-10 days. During the healing process, the patient should avoid extraneous manipulation of the treatment area. Showers are permitted, but care should be taken to lightly pat lasered areas dry. Gentle cleansing of the treatment area with water and a mild soap followed by application of a topical ointment can be used to keep the area clean. A nonstick bandage should cover the treated area. The treated area should be evaluated in approximately 6-8 weeks, at which time another laser treatment can be delivered. The most common adverse effect is hyperpigmentation of lasered skin. Hyperpigmentation spontaneously fades with avoidance of or protection from sun exposure. If hyperpigmentation is present, consider postponing subsequent laser treatments to avoid interference from a competing chromophore (or target), such as melanin. Consider prescribing a hydroquinone-containing cream (applied qd-bid) to speed up the fading process. Hypertrophic scars have an average of at least 50-80% improvement after 2 laser treatments. Keloid scars and more fibrotic hypertrophic scars usually require additional laser treatments to achieve desired results. Postoperative management is similar to the protocol followed by patients treated for hypertrophic and keloid scars. Instruct patients to gently cleanse treatment areas with water and a mild soap. A topical ointment such as petrolatum should be applied daily and the treatment area covered with a nonstick bandage. Patients should be advised to avoid sun exposure to the treatment area during the course of treatment. The pulsed Er:YAG lasers are 10 times more selective for water than their carbon dioxide counterparts; therefore, they result in enhanced tissue vaporization and reduced residual thermal damage to the dermis. Postoperative erythema is decreased; however, the limited photothermal effect on tissue is countered by an overall decrease in clinical improvement. Thus, short-pulsed Er:YAG laser resurfacing delivers less collagen shrinkage compared with that observed with carbon dioxide laser treatment. For milder atrophic scarring, the Er:YAG may be the preferred modality given the shorter postoperative recovery times. Typically, 300 mJ of energy and 60 watts of power with variable-sized and variable-shaped patterns are the parameters used with the computer pattern generator (CPG) scanning device (Coherent UltraPulse). Scanning devices attached to other carbon dioxide laser systems (Sharplan FeatherTouch or Luxar NovaPulse) can be used at 5-20 watts per scan, depending on the system and severity of scarring. Scan sizes ranging from 4-10 mm in diameter are delivered to the treatment area. Treatment usually requires 2-3 passes, and the physician should take care to remove all partially desiccated tissue between passes. Individual scar edges can be further sculpted using smaller-diameter spots or scans following treatment of the entire cosmetic unit. The most severe complications of laser resurfacing include hypertrophic scarring and ectropion formation, which may result from overly aggressive intraoperative laser technique. Hypertrophic burn scars can be effectively treated with 585 nm PDL irradiation as described earlier; ectropion typically requires surgical reconstruction. Ablative laser resurfacing with either a carbon dioxide or Er:YAG laser may be beneficial. After the initial treatment, allow the skin to heal, which may take 6-8 weeks. The postoperative erythema may last for up to 12 weeks. The scars can be treated with additional laser sessions to achieve the desired dermal remodeling and skin appearance. 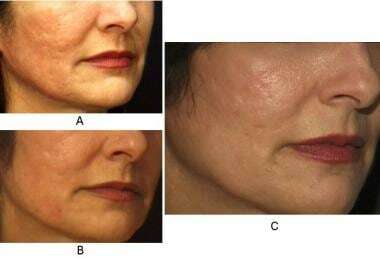 As stated, resurfacing with a carbon dioxide laser can carry many potential risks such as delayed posttreatment hypopigmentation and scarring, as well as prolonged healing after the procedure. This ablative laser can be effective alone for scarring after acne, but the risks must be considered before a patient undergoes this procedure. To enhance the selectivity of the carbon dioxide laser, some have tried combining it with an Er laser, which is taken up more preferentially than the carbon dioxide beam (detailed below). The erbium laser's cutaneous destruction is much more localized because the energy dissipates quickly within the targeted tissues. This procedure is more selective and less damaging to the skin than carbon dioxide laser resurfacing. In contrast to ablative resurfacing, nonablative lasers do not noticeably disrupt the epidermis, but deliver thermal energy and damage to the underlying dermis. These lasers induce collagen remodeling and production, which is predominantly collagen type III. In time, the collagen expression changes to contain a greater proportion of type I collagen. With these lasers, clinical improvement usually requires more than one treatment and results can continue to improve months after the laser treatments have been completed. In 1996, Alster and McMeekin demonstrated that the 585-nm PDL could improve erythematous and hypertrophic acne scars. In 22 patients, significant improvements in texture and redness were seen after 1 or 2 treatments (6-7 J/cm2; 7-mm spot size). Six weeks following only one laser treatment, the mean improvement was 67.5%. Eight of the patients received an additional laser treatment and saw an average improvement of 72.5% 6 weeks later. Atrophic acne scarring has been treated with a 1064-nm Q-switched Nd:YAG laser. Eleven patients with mild-to-moderate atrophic scarring were treated with 5 laser sessions at 3-week intervals. The laser was set at an average fluence of 3.4 J/cm2, 4- to 6-nanosecond pulse duration, and a 6-mm spot size. Skin roughness was significantly better (23.3%) 1 month after the fifth laser session. Further improvements continued with time. At the 6-month follow-up, patients demonstrated a statistically significant 39.2% improvement from baseline measurements. This sustained improvement is likely from an enduring dermal collagen remodeling after the laser treatments have concluded. The long-term results and safety profile (ie, mild-to-moderate erythema, pain, pinpoint petechiae) allow this laser to be a viable option for patients with mild-to-moderate atrophic acne scars. The 1320 nm Nd:YAG laser with a built-in cryogen cooling spray has been used for acne scarring. In 2004, Sadick and Schecter  treated 8 patients with 6 monthly irradiations of 3 passes each and found a modest improvement. Ice-pick scars without fibrosis responded more favorably than those with fibrous tracts. Statistically significant improvements were noted in 7 of 8 patients 5 months and 1 year after their final treatments. When only 3 treatments were used, another study found that atrophic scars improved the most. In Asian patients, there may be only a mild response. Of 27 patients treated, 8 had no objective improvement and 9 were only mildly better than at baseline. This modality may produce better results if combined with another modality, such as surgery or an intense-pulsed light source (IPL). A 2004 comparison by Tanzi and Alster  evaluated the efficacy of a 1450-nm diode laser versus a 1320-nm Nd:YAG for atrophic facial scars. Twenty patients with mild-to-moderate scarring each received 3 monthly treatments. Each half of the patient's face was randomized to 1 of the 2 lasers. After completing the treatments, the greatest clinical effect was seen at 6 months, which was consistent with the observed histologic increase in collagen production. Only modest improvements were seen with both lasers, but the 1450-nm diode laser resulted in greater improvements. Both lasers are safe, noninvasive options to improve the appearance of mild-to-moderate facial atrophic scars. The undamaged surrounding tissue allows for a reservoir of viable tissue, permitting rapid epidermal repair, decreasing patient downtime. Both ablative and nonablative fractional lasers have been tried successfully for the treatment of scars. A 2010 pilot clinical study demonstrated that lasers could also be used immediately after surgery to reduce the appearance of scars. The laser-assisted skin-healing (LASH) technique induces a temperature elevation in the skin, which modifies the wound healing process. Capon et al demonstrated that 810-nm diode laser treatment, performed immediately after surgery, can improve the appearance of a surgical scar. The dose plays a significant role in scar improvement and must be well controlled. The authors additionally suggested that LASH could be used for hypertrophic scar revision. Current laser technology permits successful treatment of scars and striae distensae. It is imperative to appropriately classify the type of scars and striae distensae present to determine which laser is likely to be effective. The 585-nm PDL is best used to treat hypertrophic scars, keloids, and striae. The carbon dioxide and Er:YAG laser systems effectively resurface atrophic scars. Fractional lasers are becoming increasingly used for treating scars owing to their efficacy with reduced downtime compared with the ablative nonfractional carbon dioxide and Er:YAG lasers. Skin types I-III are best suited for treatment. Hypertrophic scars are more amenable to treatment. Treat all body locations when possible. Patients should not take anticoagulants. In most circumstances, use topical anesthesia or no anesthesia. Patients should use a topical antibiotic ointment. Advise the patient to use sunscreen and avoid sun exposure. Evaluate for re-treatment at 6-8 weeks. Skin types I-II are best suited for treatment. This laser is used for nonpitted atrophic scars. Previously treated scars are more difficult to treat. Patients should discontinue isotretinoin at least 6 months prior to treatment. Patients should be free of concurrent infection and inflammatory disease. Intravenous anesthesia is used in most cases. Use energies that exceed critical vaporization threshold (>5 J/cm2). Remove partially desiccated skin between passes. Patients should use healing ointments and semiocclusive dressings. Patients should use ice or cooling masks as needed. Patients should frequently clean skin. Consider prophylactic antibiotics and pain or sleep medications. Observe for and treat adverse effects and complications as early as possible. Akaishi S, Ogawa R, Hyakusoku H. Keloid and hypertrophic scar: neurogenic inflammation hypotheses. Med Hypotheses. 2008. 71(1):32-8. [Medline]. English RS, Shenefelt PD. Keloids and hypertrophic scars. Dermatol Surg. 1999 Aug. 25(8):631-8. [Medline]. Habif TP. Dermatologic Surgical Procedures. Clinical Dermatology. 4 ed: Elsevier Health Science. 2009. Falanga V, Iwamoto S. Wound Repair: Mechanisms and Practical Considerations. Wolff K, Goldsmith LA, Katz SI, Gilchrest BA, Paller AS, Leffell DJ, eds. Fitzpatrick's Dermatology in General Medicine. 7th ed. McGraw-Hill; 2008. 95(1): 84-90; discussion 91-2. Fonder MA, Lazarus GS, Cowan DA, Aronson-Cook B, Kohli AR, Mamelak AJ. Treating the chronic wound: A practical approach to the care of nonhealing wounds and wound care dressings. J Am Acad Dermatol. 2008 Feb. 58(2):185-206. [Medline]. Profyris C, Tziotzios C, Do Vale I. Cutaneous scarring: Pathophysiology, molecular mechanisms, and scar reduction therapeutics Part I. The molecular basis of scar formation. J Am Acad Dermatol. 2012/01. 66(1):1-10; quiz 11-12. Tziotzios C, Profyris C, Sterling J. Cutaneous scarring: Pathophysiology, molecular mechanisms, and scar reduction therapeutics Part II. Strategies to reduce scar formation after dermatologic procedures. J Am Acad Dermatol. Jan 2012. 66(1):13-24 quiz 25-16. Anderson RR, Parrish JA. Selective photothermolysis: precise microsurgery by selective absorption of pulsed radiation. Science. Apr 29 1983. 220(4596):524-527. Apfelberg DB, Maser MR, Lash H, White D, Weston J. Preliminary results of argon and carbon dioxide laser treatment of keloid scars. Lasers Surg Med. 1984. 4(3):283-90. [Medline]. Norris JE. The effect of carbon dioxide laser surgery on the recurrence of keloids. Plast Reconstr Surg. Jan 1991. 87(1):44-49; discussion 50-43. Alster TS, West TB. Treatment of scars: a review. Ann Plast Surg. 1997 Oct. 39(4):418-32. [Medline]. Abergel RP, Dwyer RM, Meeker CA, Lask G, Kelly AP, Uitto J. Laser treatment of keloids: a clinical trial and an in vitro study with Nd:YAG laser. Lasers Surg Med. 1984. 4(3):291-295. Alster TS, Kurban AK, Grove GL, Grove MJ, Tan OT. Alteration of argon laser-induced scars by the pulsed dye laser. Lasers Surg Med. 1993. 13(3):368-73. [Medline]. Alster TS. Improvement of erythematous and hypertrophic scars by the 585-nm flashlamp-pumped pulsed dye laser. Ann Plast Surg. 1994 Feb. 32(2):186-90. [Medline]. Ebrahimi A, Kazemi HM, Nejadsarvari N. Experience with esthetic reconstruction of complex facial soft tissue trauma: application of the pulsed dye laser. Trauma Mon. 2014 Aug. 19(3):e16220. [Medline]. Dierickx C, Goldman MP, Fitzpatrick RE. Laser treatment of erythematous/hypertrophic and pigmented scars in 26 patients. Plast Reconstr Surg. 1995 Jan. 95(1):84-90; discussion 91-2. [Medline]. Alster TS, Williams CM. Treatment of keloid sternotomy scars with 585 nm flashlamp-pumped pulsed-dye laser. Lancet. May 13 1995. 345(8959):1198-1200. Alster TS, McMeekin TO. Improvement of facial acne scars by the 585 nm flashlamp-pumped pulsed dye laser. J Am Acad Dermatol. 1996 Jul. 35(1):79-81. [Medline]. Nouri K, Jimenez GP, Harrison-Balestra C, Elgart GW. 585-nm pulsed dye laser in the treatment of surgical scars starting on the suture removal day. Dermatol Surg. 2003 Jan. 29(1):65-73; discussion 73. [Medline]. Goldman MP, Fitzpatrick RE. Laser treatment of scars. Dermatol Surg. 1995 Aug. 21(8):685-7. [Medline]. Alster TS, Lewis AB, Rosenbach A. Laser scar revision: comparison of CO2 laser vaporization with and without simultaneous pulsed dye laser treatment. Dermatol Surg. 1998 Dec. 24(12):1299-302. [Medline]. Tsao SS, Dover JS, Arndt KA, Kaminer MS. Scar management: keloid, hypertrophic, atrophic, and acne scars. Semin Cutan Med Surg. 2002 Mar. 21(1):46-75. [Medline]. Alster TS, Handrick C. Laser treatment of hypertrophic scars, keloids, and striae. Semin Cutan Med Surg. 2000 Dec. 19(4):287-92. [Medline]. Lupton JR, Alster TS. Laser scar revision. Dermatol Clin. 2002 Jan. 20(1):55-65. [Medline]. Bak H, Kim BJ, Lee WJ, Bang JS, Lee SY, Choi JH. Treatment of striae distensae with fractional photothermolysis. Dermatol Surg. 2009 Aug. 35(8):1215-20. [Medline]. Omi T, Kawana S, Sato S, Bonan P, Naito Z. Fractional CO2 laser for the treatment of acne scars. J Cosmet Dermatol. 2011 Dec. 10(4):294-300. [Medline]. Fabbrocini G, Annunziata MC, D'Arco V, et al. Acne scars: pathogenesis, classification and treatment. Dermatol Res Pract. 2010;. 2010:2190-5. Rivera AE. Acne scarring: a review and current treatment modalities. J Am Acad Dermatol. Oct 2008. 59(4):659-676. Shah S, Alster TS. Laser treatment of dark skin: an updated review. Am J Clin Dermatol. Dec 1 2010. 11(6):389-397. Alster TS, Tanzi EL. Hypertrophic scars and keloids: etiology and management. Am J Clin Dermatol. 2003. 4(4):235-43. [Medline]. Alster T, Zaulyanov L, Zaulyanov-Scanlon L. Laser scar revision: a review. Dermatol Surg. 2007 Feb. 33(2):131-40. [Medline]. Groover IJ, Alster TS. Laser revision of scars and striae. Dermatol Ther. 2000. 13(1):50-59. Zachariae H. Delayed wound healing and keloid formation following argon laser treatment or dermabrasion during isotretinoin treatment. Br J Dermatol. 1988 May. 118(5):703-6. [Medline]. Chike-Obi CJ, Cole PD, Brissett AE. Keloids: pathogenesis, clinical features, and management. Semin Plast Surg. 2009 Aug. 23(3):178-84. [Medline]. [Full Text]. Waldorf HA, Kauvar AN, Geronemus RG. Skin resurfacing of fine to deep rhytides using a char-free carbon dioxide laser in 47 patients. Dermatol Surg. 1995 Nov. 21(11):940-6. [Medline]. Alster TS, Nanni CA, Williams CM. Comparison of four carbon dioxide resurfacing lasers. A clinical and histopathologic evaluation. Dermatol Surg. 1999 Mar. 25(3):153-8; discussion 159. [Medline]. Alster TS, Kauvar AN, Geronemus RG. Histology of high-energy pulsed CO2 laser resurfacing. Semin Cutan Med Surg. 1996 Sep. 15(3):189-93. [Medline]. Smith KJ, Skelton HG, Graham JS, Hamilton TA, Hackley BE, Jr., et al. Depth of morphologic skin damage and viability after one, two, and three passes of a high-energy, short-pulse CO2 laser (Tru-Pulse) in pig skin. J Am Acad Dermatol. Aug 1997. 37(2 Pt 1):204-210. Stuzin JM, Baker TJ, Baker TM, Kligman AM. Histologic effects of the high-energy pulsed CO2 laser on photoaged facial skin. Plast Reconstr Surg. 1997 Jun. 99(7):2036-50; discussion 2051-5. [Medline]. Alster TS. On: increased smooth muscle actin, factor XIIIa, and vimentin-positive cells in the papillary dermis of carbon dioxide laser-debrided porcine skin. Dermatol Surg. 1998 Jan. 24(1):155. [Medline]. West TB. Laser resurfacing of atrophic scars. Dermatol Clin. 1997 Jul. 15(3):449-57. [Medline]. Fitzpatrick RE, Tope WD, Goldman MP, Satur NM. Pulsed carbon dioxide laser, trichloroacetic acid, Baker-Gordon phenol, and dermabrasion: a comparative clinical and histologic study of cutaneous resurfacing in a porcine model. Arch Dermatol. 1996/04. 132(4):469-471. Bernstein LJ, Kauvar AN, Grossman MC, Geronemus RG. The short- and long-term side effects of carbon dioxide laser resurfacing. Dermatol Surg. 1997/07. 23(7):519-525. Vas K, Gaál M, Varga E, Kovács R, Bende B, Kocsis A, et al. Effects of the Combined PDL/Nd:YAG Laser on Surgical Scars: Vascularity and Collagen Changes Evaluated by In Vivo Confocal Microscopy. Biomed Res Int. 2014. 2014:204532. [Medline]. [Full Text]. Lim TC, Tan WT. Carbon dioxide laser for keloids. Plast Reconstr Surg. 1991 Dec. 88(6):1111. [Medline]. Kang WH, Kim YJ, Pyo WS, Park SJ, Kim JH. Atrophic acne scar treatment using triple combination therapy: dot peeling, subcision and fractional laser. J Cosmet Laser Ther. 2009 Dec. 11(4):212-5. [Medline]. Majid I, Imran S. Fractional CO2 Laser Resurfacing as Monotherapy in the Treatment of Atrophic Facial Acne Scars. J Cutan Aesthet Surg. 2014 Apr. 7(2):87-92. [Medline]. [Full Text]. Friedman PM, Jih MH, Skover GR, Payonk GS, Kimyai-Asadi A, Geronemus RG. Treatment of atrophic facial acne scars with the 1064-nm Q-switched Nd:YAG laser: six-month follow-up study. Arch Dermatol. 2004 Nov. 140(11):1337-41. [Medline]. Sadick NS. Update on non-ablative light therapy for rejuvenation: a review. Lasers Surg Med. 2003. 32(2):120-8. [Medline]. Tanzi EL, Alster TS. Comparison of a 1450-nm diode laser and a 1320-nm Nd:YAG laser in the treatment of atrophic facial scars: a prospective clinical and histologic study. Dermatol Surg. 2004 Feb. 30(2 Pt 1):152-7. [Medline]. Alster TS, Tanzi EL, Lazarus M. The use of fractional laser photothermolysis for the treatment of atrophic scars. Dermatol Surg. 2007 Mar. 33(3):295-9. [Medline]. Vasily DB, Cerino ME, Ziselman EM, Zeina ST. Non-ablative fractional resurfacing of surgical and post-traumatic scars. J Drugs Dermatol. 2009 Nov. 8(11):998-1005. [Medline]. Cho SB, Lee SJ, Cho S, Oh SH, Chung WS, Kang JM. Non-ablative 1550-nm erbium-glass and ablative 10 600-nm carbon dioxide fractional lasers for acne scars: a randomized split-face study with blinded response evaluation. J Eur Acad Dermatol Venereol. 2010 Aug. 24(8):921-5. [Medline]. Capon A, Iarmarcovai G, Gonnelli D, Degardin N, Magalon G, Mordon S. Scar prevention using Laser-Assisted Skin Healing (LASH) in plastic surgery. Aesthetic Plast Surg. 2010 Aug. 34(4):438-46. [Medline]. Wada T, Kawada A, Hirao A, Sasaya H, Oiso N. Efficacy and safety of a low-energy double-pass 1450-nm diode laser for the treatment of acne scars. Photomed Laser Surg. 2012 Feb. 30(2):107-11. [Medline].